One of the oldest country stores in America houses penny candy, vintage wares and a ghost named Ella. I never thought the day would come when the sight of a bonafide hitchhiker would catch memore off guard than the time I saw a six-foot, ponytail-clad man vaping as he navigated rush-hour city traffic on a hoverboard. And yet, as I drive down Putnam Pike and come upon a portly, white-bearded fellow with his thumb out, I slow down. Not to offer him a ride — I’ve seen enough horror films where twenty-something blondes meet their demise in such a manner, thank you very much — but to marvel. Up close, Mr. Hitchiker seems more like a Santa Claus than a Ted Bundy, but you can never be too careful. After I pass, I wonder if anyone else is feeling more altruistic and check my rearview mirror. A green pickup truck has pulled over, but I round a corner before I can see what happens next. One thing’s clear: Toto, we’re not in Providence anymore. Chepachet, a village in the town of Glocester, is starkly different from the concrete jungle where I’ve worked for the past four years, with its winding rural roads lined with looming trees and squat homesteads, generously spaced apart. I count four deer corpses and two “No Power Plant in Northern RI” signs before I reach my destination of Brown and Hopkins, one of the oldest country stores in the United States. As I park, I note that the street is considerably busier than the ones I took to get here, boasting a post office, an antique store, eateries and more. Seeing that I’m not wearing heels and that we’re of similar heights — about five-seven, five-eight — she delightedly exclaims that it’s so great to see another tall woman and then offers me a piece of candy. It’s the closest thing I’ve experienced to Southern hospitality since my trip to New Orleans back in 2009. Less than a minute later, Elizabeth Yuill, Brown and Hopkins’s owner and operator of fourteen years, appears in the main foyer. A Rhode Island native with an infectious laugh, Yuill says she’s always been in the country store business, having started out in customer service and later co-owning a shop down in Wickford. But once she parted ways with her old partner, she found herself in the market for a new venture. Yuill contacted a friend in real estate and then marched herself right to Chepachet, with which she was already familiar, having previously worked in nearby Scituate. The rumors were true: Brown and Hopkins was indeed looking for a buyer and, as Yuill says, it all just worked out. And it certainly is a tradition. Originally constructed by Timothy Wilmarth as a residence and hattery in 1799, Brown and Hopkins became a general store when it was sold to Ira Evans in 1809. It didn’t attain its present-day name, however, until 1921 when it was purchased by James L. Brown and William W. Hopkins. Today, Brown and Hopkins sells a little bit of everything. It still displays a lot of vintage wares and local products like jams, honey, maple syrup, soaps and soy candles, but it has ventured into modern trends, as well. There are bath bombs (made of goat milk powder, they retain a farm-like element), veggie dips and margarita mixes for entertaining, witty greeting cards, Stonewall Kitchen supplies, craft brew paraphernalia, dish towels, handmade clothing, wall art and more. 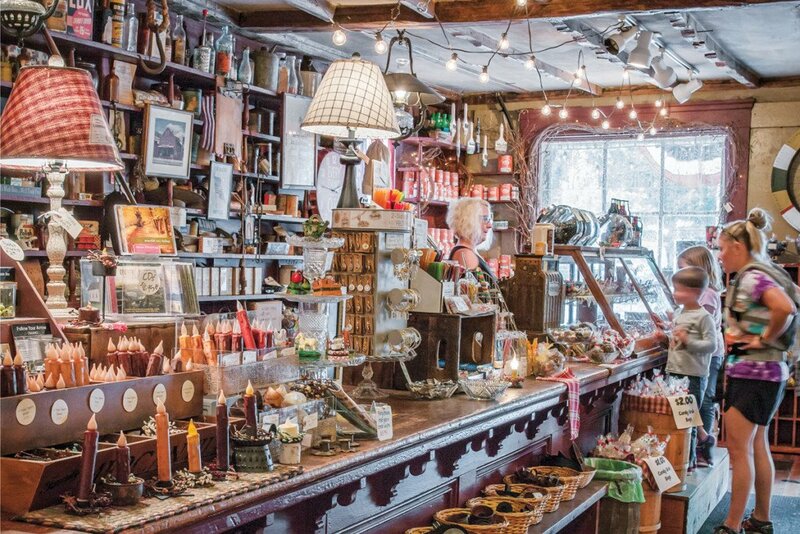 Still, despite being around for more than 200 years, the business has hung on to quite a few relics from the nineteenth century, including a twenty-four-foot pine wood counter that makes up not only the checkout area, but also the penny candy display. From day one, Yuill had people asking if she planned to get rid of the candy counter. There are also plenty of other antiques, from a tall potbelly stove that she describes as retired yet still admired to two dry sinks installed on the second level to a mysterious vault that Yuill says she’s never managed to crack in the fourteen years she’s operated the store. 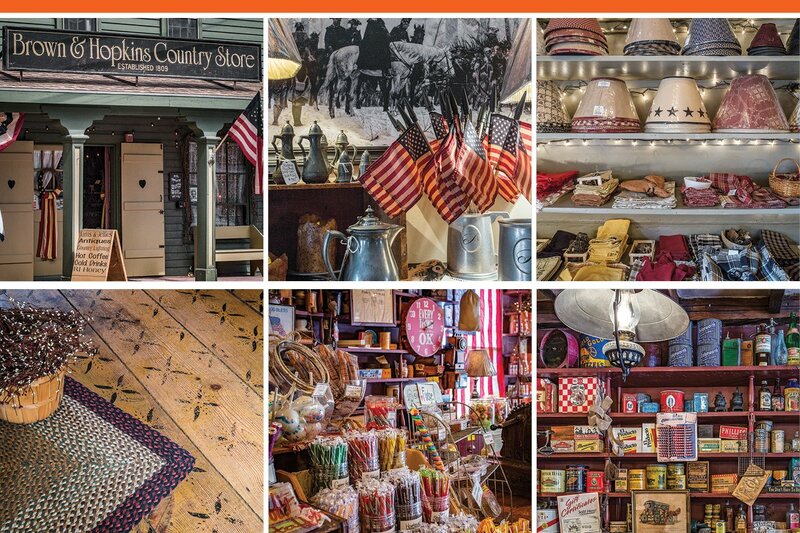 Top, left to right: Brown and Hopkins Country Store was first established as a general store in 1809; a sneak peek of the store’s historical room located on its second level; Brown and Hopkins sells homey items like cloth napkins, dish towels and lampshades. Bottom, left to right: The wide plank floors are original to the building, which was built in 1799 as a private residence and hattery; part of Brown and Hopkins’s famous penny candy display; an entire wall dedicated to showcasing vintage wares. Photography by Chris Vaccaro. When I ask if it’s true that the building is haunted, all of the surrounding employees laugh and nod knowingly. “There have been a few encounters,” Yuill says. One time an employee happened upon an unknown woman with long brown hair in the upstairs bedroom, solemnly staring into an open suitcase. When the employee returned with a coworker, the figure had vanished. Yuill herself has had a few run-ins with the supernatural at the store. Once, while taking down a chandelier in the very same room where the suitcase anomaly occurred, she felt an odd sensation. Her clothes were snag-free, but when Yuill looked back at the chandelier on the ground, it was spinning. Over the years, both customers and employees have claimed they witnessed random flashes around the establishment, and paranormal investigators have visited and documented unexplained voice recordings (see for yourself on Brown and Hopkins’s website). A former tenant of the upstairs living quarters even lined the windows and door frames with salt, said to ward off malevolent spirits. But Yuill doesn’t believe the ghost of Brown and Hopkins is evil. In fact, she seems to be more good-humored than anything. I would love to say the lights flickered or that I felt a sudden chill at some point during my visit, but the quaint store is the opposite of spooky. Even the supposedly haunted second floor feels homey thanks to its cabin-woodlands-meets-local-history theme (think adorable owl statues and George Washington prints). I find the area even less intimidating when Yuill reveals that, come Columbus Day, the entire upper level gets stripped and transformed into a winter wonderland. Antiques and Treasures, the shopping and company at Brown and Hopkins and the good eats at Tavern on Main (also said to have ghostly inhabitants, for all you thrill seekers out there). Being a fall fanatic myself, I know for a fact that such an itinerary will certainly make its way onto my September/October calendar. Twenty-five minutes well spent if it means you get a little more hitchhikers, hauntings and Hopkins in your life, I’d say.